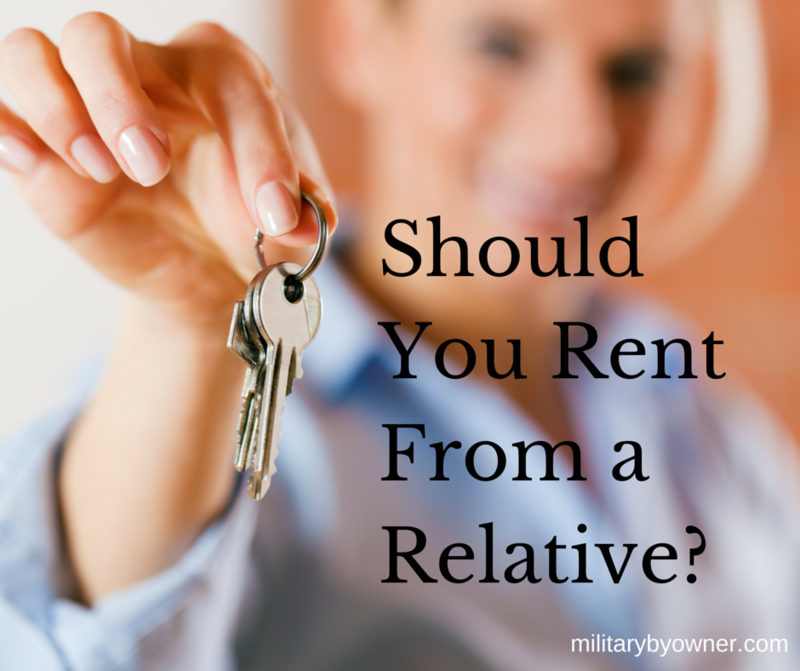 Should You Rent From a Relative? It's military moving season, and you finally have your long-awaited orders in hand. You're bursting with excitement as you look forward to the adventures ahead. Naturally, you tell your friends and family about your upcoming plans. Upon hearing the news, your Uncle Joe emails you a link to his rental property with a great commute. 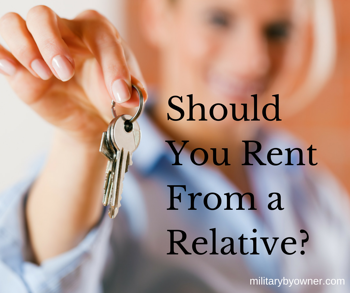 Should you rent from a family member? I probably can't answer that question for your specific situation, but as a renter, do not expect that your level of friendship or your closeness to family ties will entitle you to preferential treatment. From start to finish, treat the situation as a tenant and landlord business transaction. Here are some tips that may help you navigate any potential pitfalls. It is in your Uncle Joe’s best interest to offer you the property at fair market value rent. This keeps his mortgage obligations and tax deductions on track. If your relative kindly offers to reduce the rent for you, be the best tenant you can be! Keep the property in good condition. Follow through with whatever terms are set in the lease agreement. You still need a lease agreement. Ensure that the lease agreement follows the same kind of standards you would expect from any other landlord. One issue that may arise is when the relative chooses to enter the property for repairs or inspection. Uncle Joe may feel he is entitled to drop by at any time, without notice. Clarify that as the renter you would prefer that the landlord give 24 hours' advance notice before entering the property. If you and your relative will be sharing common areas, define the guidelines for upkeep, privacy, and hours of use. What if you’d like to customize the property? What color can you paint the walls? What plants can you add to the landscaping? Ask these questions and explain your intentions to clarify what is allowed in the lease terms. As much as you may appreciate the opinions of your Aunt Martha or your Cousin John, avoid discussing the details of your lease agreement with other family members. No matter how close your family ties may be, it may feel uncomfortable to hash out every little detail of the lease agreement with your relative. But the more you talk things through, the more thorough you can be, and the better your relationship will fare. Happy PCS!